This program by the pioneering world music group Ancient Future concentrates on material based the music of the Arab diaspora, India, and Spain, showcasing concepts such as taqsim (an Arabic method of melodic improvisation), tala (the recurring rhythmic cycles of Indian classical music), and compás (the rhythmic structure of flamenco). The program includes music from Ancient Future's broad repertoire including current releases on Ancient-Future.Com Records such as Ancient Future's Planet Passion (remastered to celebrate the 30th anniversary of the band), Yearning for the Wind, and the Archive of Future Ancient Recordings. Ancient Future is the first and longest running musical organization dedicated exclusively to the mission of creating world fusion music. The term was coined by bandleader Matthew Montfort in 1978 to describe Ancient Future’s unusual blend of musical traditions from around the world. Billboard calls the group "trendsetters" for their early contributions to the movement, which seeks to show how people from different cultures can grow by learning from each other. The program features scalloped fretboard guitarist Matthew Montfort performing with Arabic violin virtuoso Georges Lammam, who is also featured in the Arabic Beats program, and a master percussionist such as Vishal Nagar (Indian tabla). There are also trio and quartet versions including santurist Mariah Parker. Ancient Future Trio Hi-Res Photo (5.3" x 10.2" 300 dpi jepg, 3.9 MB) by Jialiang Len Gao. Source: Unauthorized lo-fi fan posting from performance at Peña Pachamama in San Francisco, 1/17/2010. Shown: Rasa Vitalia (belly dance), Mariah Parker (santur), Matthew Montfort (scalloped fretboard guitar), and Salaheddin Takesh (Arabic percussion). Source: Unauthorized lo-fi fan posting from Himalayan Fair. 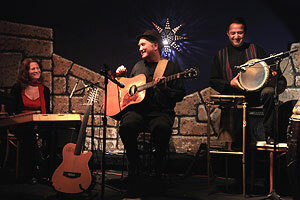 Shown: Mariah Parker (santur), Matthew Montfort (scalloped fretboard guitar), and Salaheddin Takesh (Arabic percussion). Georges Lammam (Arabic violin, vocals) adds an element of romantic fire to the Planet Passion CD. Born in Beirut, Lebanon, he is well-known in the Middle East as well as the US, having performed with the most well-known singers of the Middle East. He is on the faculty of the Near East Music and Dance Camp in Mendocino. Vishal Nagar. Considered one of the most gifted tabla players of his generation, Vishal was born into a family of musicians and had his initial training with the late Ustad Latif Ahmed Khan of the Delhi Gharana and continued his training under the guidance of Ustad Shamim Ahmed Khan. He also has had intense rhythmic training from his mother, the renowned and highly respected Kathak dancer and vocalist, Urmila Nagar. Vishal has been praised in the Indian press for his unique combination of melodic tabla sound production with masterful command of rhythm. Vishal has had the privilege of performing with many renowned artists: Ustad Shujaat Khan, Guru Urmila Nagar, Vidhwan Trichur Ramachandran, Pandit Ramesh Misra, and Kala Ramnath, to name a few. Vishal has also expanded his cultural boundaries and collaborated with musicians from around the world. Some of his memorable works have been with the Ghanaian Guitarist Koo Nimo with whom he also appeared in WOMAD USA (a leading world dance and music festival started by Peter Gabriel). Salaheddin Takesh (Arabic percussion) was born in Azerbaijan, Iran. In his long career as one of the world's finest Arabic percussionists, Salaheddin Takesh has worked with the top Arabic musicians and dancers in Europe and the Middle East. He is on the faculty of the Near East Music and Dance Camp in Mendocino, CA. Faisal Zedan (doumbek, tar, riqq, derbakki, darabukka, doumbec, darabuka, tambourine, frame drum) is a master percussionist in the Syrian classical tradition. Born in 1972 in oum D'Baib, Syria, Faisal Zedan grew up impassioned with the derbakki. At the age of 15, after intensive study with a local drummer, Faisal began studies of the wide repertoire of Arabic music. Upon arriving in California in 1992, he met UCLA's noted professor of ethnomusicology, Dr. Ali Jihad Racy, and was invited to join the acclaimed UCLA Near East Music Ensemble. Faisal co-founded the Near East music group, Kan Zaman, in 1993. Faisal is on the faculty of the the Middle East Music Camp and the Kosmos Camp in Northern California. Mariah Parker (composition, piano, santur and hammered dulcimer), while completing her degree in music at UC Santa Cruz, worked with ethnomusicologist Fred Lieberman on the book projects of Mickey Hart: "Planet Drum" and "Drumming at the Edge of Magic." She has worked with Dumisani Maraire (the brilliant Shona musician), Paulina Oliveros (the very well-known composer), and with tabla master Anuradha Pal (considered one of the best female musicians of India). 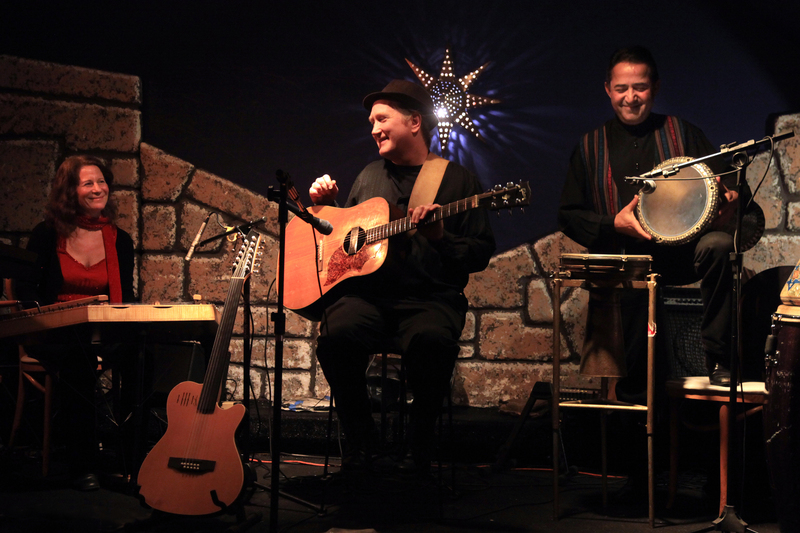 Arabic Beats: Master American and Arabic musicians play Arabic dance grooves. Features Georges Lammam (Arabic violin), Matthew Montfort (guitars), Salaheddin Takesh (Arabic percussion), Doug McKeehan (keys), and Middle Eastern dancers.